Calgon Carbon’s extensive range of activated carbons and adsorption systems for air purification and environmental air treatment are designed to meet specific customer needs in a variety of applications. air emissions, gas process streams, storage tank vents, internal work air environments, and soil remediation vents. Having the right carbon product is just one component of a complete air purification program. 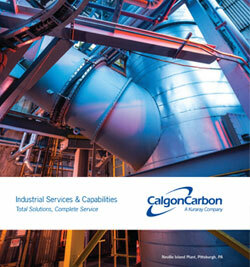 To ensure optimal performance of the carbon, Calgon Carbon has developed a complete line of adsorption systems, capable of treating air flows ranging from a few standard cubic feet per minute (scfm) to thousands of scfm, which can be quickly delivered and easily installed at any treatment site. Remove mercury emissions from flue gas streams in coal fired electric plants and boilers. Control of organics emissions (hazardous, toxic or create nuisance odors) in petroleum and chemical plants. Applied to vapor phase systems to effectively remove organic contaminants and prevent their discharge back into the environment during air stripping, soil excavation, and in situ soil extraction applications. For treatment of odorous emissions from storage tank vents, reactor vents, waste treatment plants and landfills.